Looking back over the past four weeks, I get a sense of overwhelming gratitude. I know that everything was divine will and we were just instruments. How else can you explain converting an empty house into a fully furnished home in two weeks, and an old garage into a place of worship simultaneously? 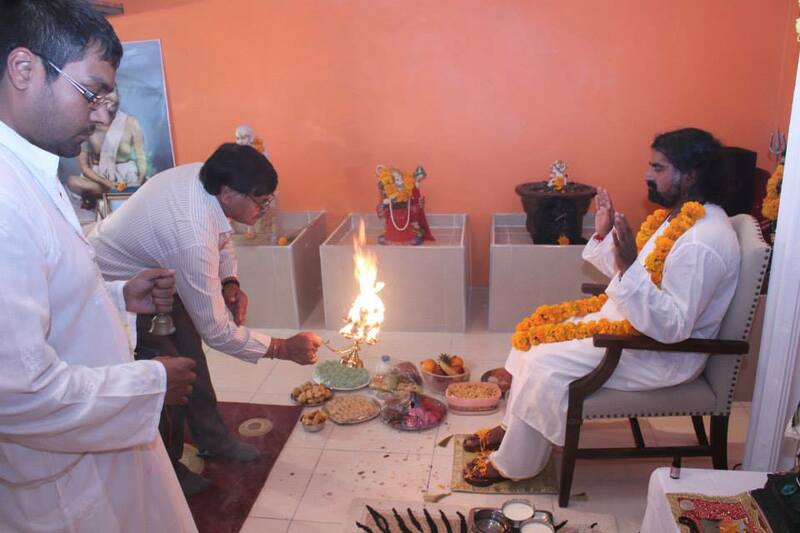 I would like to share my experience with you, and take you on the journey we went through in building the first temple dedicated to our beloved Guru, Shree Raja Yogi MohanJi. Like everything, all actions begin with a first step. Even this step clearly showed the grace of MohanJi. I have been looking for a home for a long time, but nothing seemed to come right until now ( I wonder why 😀 lol). The whole story of getting lost and eventually finding myself outside the property, the agent just happened to be there, getting a loan that was being refused, other offers being put forward for the property……all this is a story for another time…..lol. 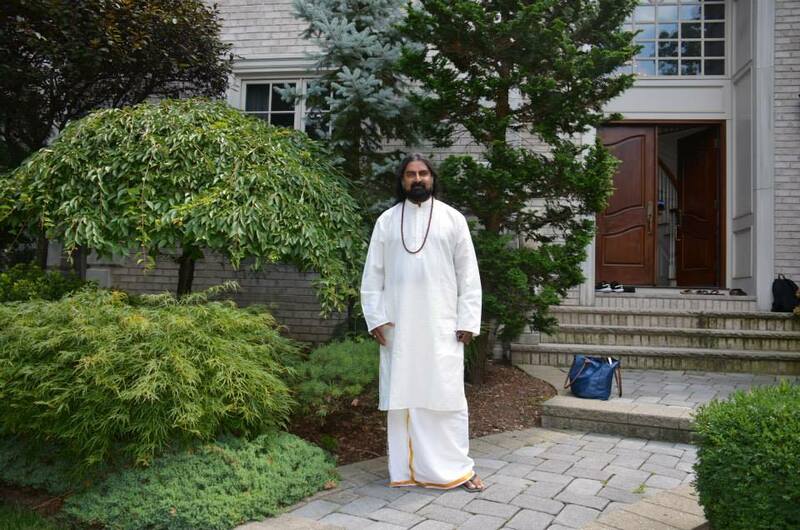 But suffice to say, MohanJi kept his promise to me…and the property was finally purchased. The temple started out as a double garage, full of webs, dirty walls, old shelves and vibes that screamed “workshop” and not the serene atmosphere you would expect from a temple. As is customary, a small prayer was done to say thank you before the building started. And here MohanJi showed his presence. While offering a coconut, a string materialised on the palm of my hand. This string was definitely not on the coconut, as Vishal held it while I ran into the house to get some camphor. If there had been a string on the coconut, we would have seen it. There was a feeling of absolute peace and protection. This really was proof enough that MohanJi accepted the temple and will come to stay here when the shrine was ready. I started building the temple myself, slowly laying the bricks as best I could. Getting the bricks was such a challenge. Delivery issues, pricing, getting the trucks into the yard, and not to mention work and students coming down hard on me. Trying to balance work responsibilities and getting the centre ready was difficult, especially when some colleagues do not value the centre as much as you do. But through the help of close work friends, Shikara, Vickasen, Abhishek, Vishal, Aunty Praveena, Uncle Sunil, Naveen Mosa and Mosie, Uncle Raj and Aunty Reena, Aunty Rosh, Lishen… all just seemed to fall into place. A special mention goes out to my parents and Kerisha who dropped everything for the two weeks and came to the centre and spent lots of time, money and effort into getting it ready. I pray that MohanJi blesses all these people, and those I did not mention, with joy and abundance. While building, probably because of working with cement and the cold, I developed a lung infection. To me this was a test of my conviction, and I kept going. But after a while this body was weakening and we thought it best to hire some help. Eventually, after two weeks the temple was built and tiled. 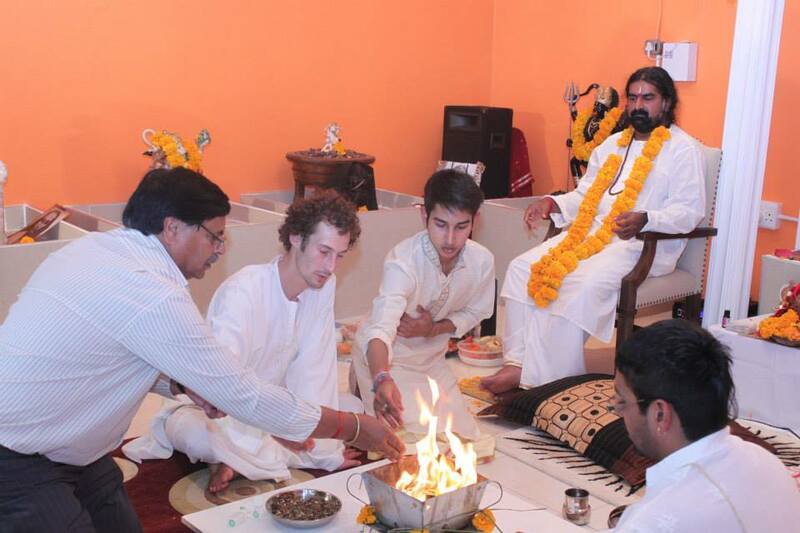 Then there was another problem…we needed lighting (imagine doing the pujas in the dark lol), but I could not afford it. I prayed to MohanJi, and he sent one of the most wonderful people I have met to help, Uncle Ramesh and his wife and uncle Kay and wife. 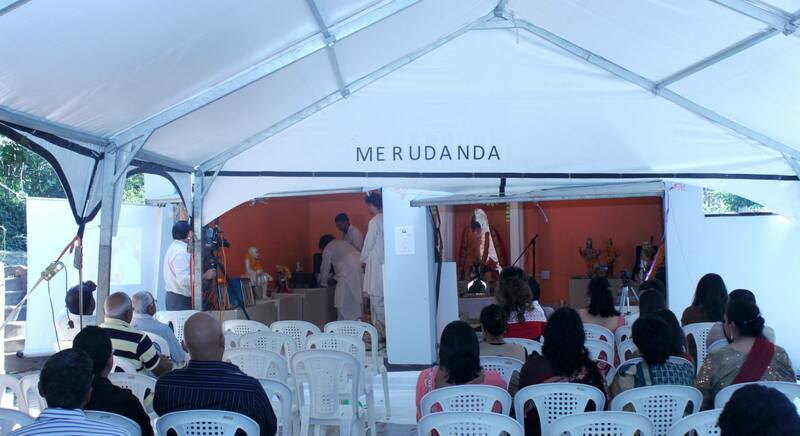 They so selflessly came in and offered their services: they sponsored and fitted the lights in the temple!! A very big thank you to them. You are truly god sent. Eventually, after much effort, lots of help, many moments of uncertainty and of course lots and lots of blessing from MohanJi, the temple was complete. 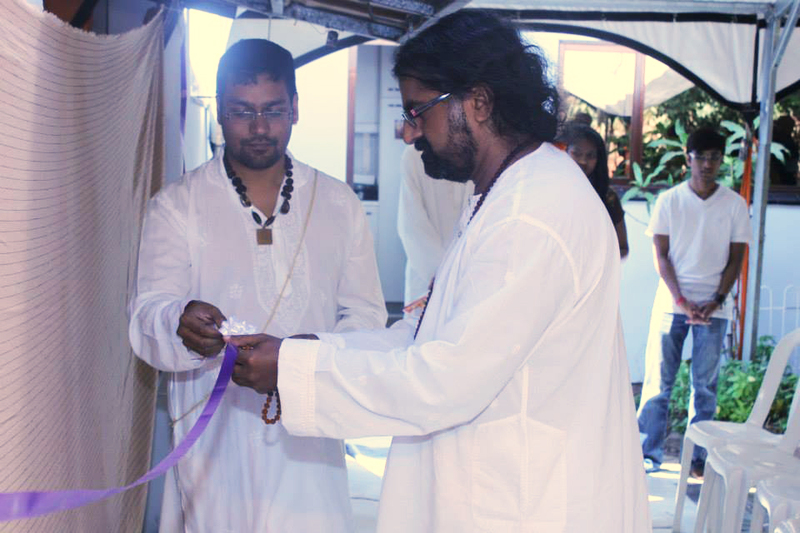 On Saturday, 7th September (the same month we met MohanJi the year before), the temple and centre was officially opened by MohanJi. 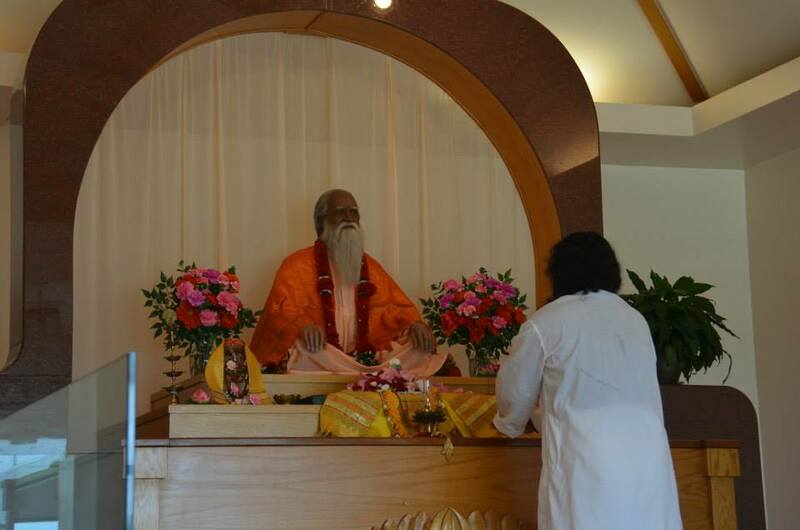 MohanJi entered the temple and blessed each of the murthis and yantras. Unfortunately, all the murthis did not come from India in time, so we had to manage with other murthis to make the temple look full …. Lol. 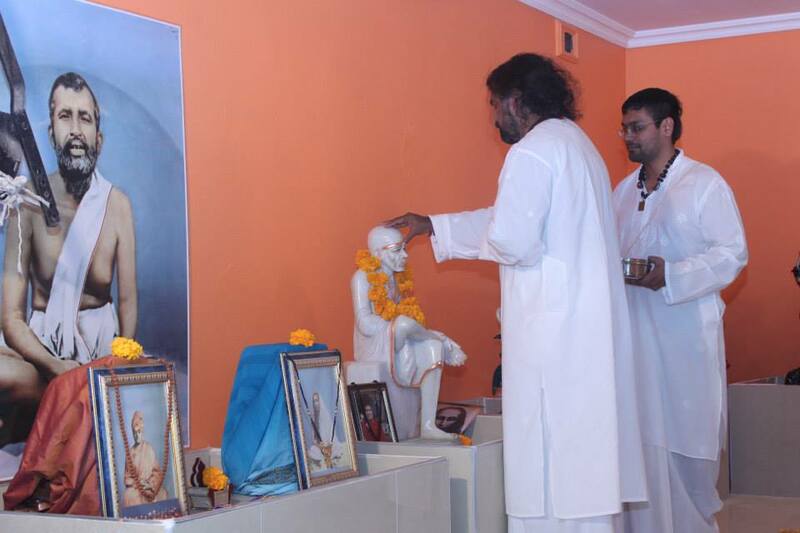 After MohanJi blessed all the Murthis he asked me to touch the feet of Shree Sai Nath Maharaj. Now his murthi is made out of marble, which is usually cold. But when I touched his feet they were warm!! His feet felt so supple, almost as if I could bend his ankle. Even the one-meter high Banu Linga changed. I always felt energy coming out of this special Linga, but after MohanJI blessed the Linga, he asked me to put my hand above it. I felt a volcano of energy, just shooting up!!! MohanJi said that this Linga now has special properties and will charge the temple and the surround area. It will charge the temple with energy that will heal and protect all those that come.The temple is not just a temple, but will be a shakti stanam, a seat of energy, and he promised that the people’s lives will change if they come to the temple regularly. 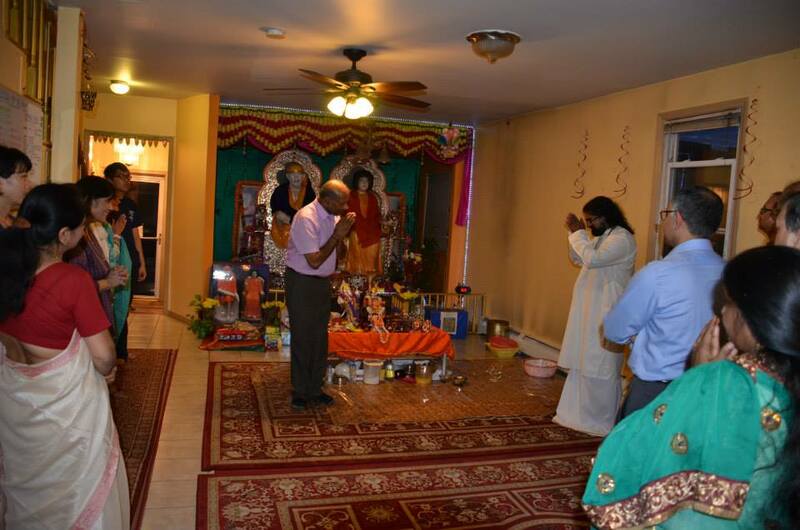 Afterwards, padam puja and arthi was performed for MohanJi. 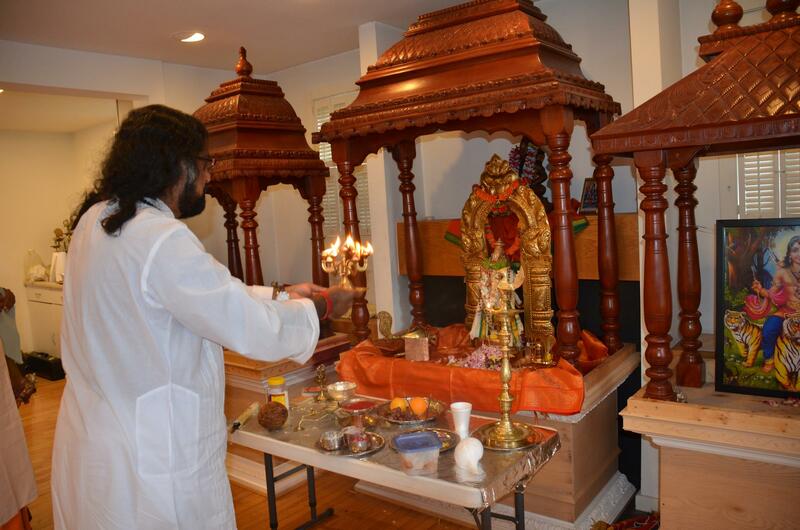 A Ganesha puja followed and a hawan with MohanJi’s gayatri. So many experiences happened, from people seeing deities in the fire, the face of Shirdi in a cup of water and a sense of utter calmness and peace. At the end of the day, there was a sense of peace. 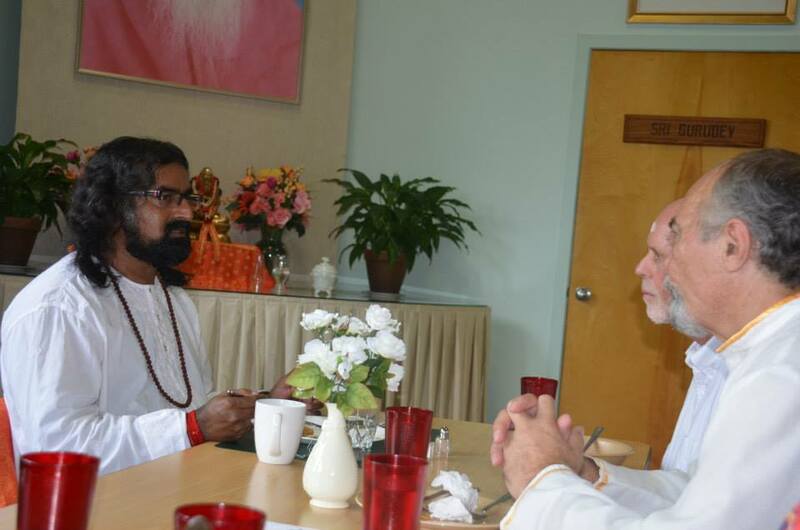 We all knew that MohanJi will stay at the ashram, and bless and protect all that come to him for help. Thank you MohanJi for all that you have done for us. Thank you for the blessings you have showered on us. Please bless every person that comes to the temple, allow them to connect to your energy, hear their cries and help them , protect and bless all that come to you. Thinking of what could have happened over the last weekend gives me an eerie feeling. But when the Master’s Grace acts as a shield, even with some turbulence in between, all ends well. Last Friday morning saw my son with a mild fever. I thought of showing him to a doctor at noon, after returning from the first parent-teacher meeting for my son. He has recently started school and is three years old. My husband left early morning for his official meeting scheduled out of town and was supposed to return the next day evening. As planned, I took my son to a Pediatrician (his clinic is on the 5th floor of our building), who prescribed some medicines for my son. The thermometer showed 36.8 degree C (98.2 F), which meant my son did not have any fever then. My son and I returned home and he had started getting a little cranky as he wasn’t feeling too well. His body was getting warmer suddenly. I went to the kitchen to quickly prepare a chapatti for him for lunch and switched on his favorite cartoon channel to keep him occupied in the meantime. All this hardly took 5-7mins. I came out of the kitchen and called my son for lunch but he appeared busy with his eyes firm on the TV. Like a lot of times this time too he didn’t respond to my first call as he was watching his favorite toon show. I thought it normal. I called him for the second time and I don’t how or why my second call was very loud. He did not even look at me! His eyes were still on the TV. I got a little anxious and wondered how engrossed this little child is with the TV! I went closer and clapped my hands to draw his attention. I was shocked when he still did not look at me. Now, I got worried and called out his name real loud. His eyes had now started drooping and as I went shook his shoulders, he fell on the sofa with his eyes rolling upward. I FROZE! My omnipresent Master had arranged everything even without my little knowledge! As I ran down crying, the same doctor was already standing close to the entrance talking to someone. By Mohanji’s grace, he did not have any patient with him else we would have lost precious time. He rushed to me as soon as he saw me with my son in my arms. Emergency aid was given to my son instantly but his condition was unstable still. I asked him if my son will be ok. He said, “I can’t say anything right now. We need to rush to the nearest hospital” – this reply froze me inside. Hearing this I frantically started calling on my husband’s phone but he didn’t answer as he was in his meeting. The phone was on silent. The doc called an ambulance immediately and put my son on oxygen. I told the doctor that since my husband is out of town, I did not have enough cash on me so I am worried how would I admit my son to the hospital. He said, “Do not worry about money. We first need to rush to the hospital.” He, along with a nurse carrying the oxygen cylinder, and a security guard of our apartments accompanied my son and me to the nearest hospital. I suddenly remembered that I had casually taken my son’s Medical Healthcard from my husband the same morning, before he left. This Healthcard would take care of all the expenses at the hospital and it was with me that very moment, too. I thanked Mohanji! How precise was the Divine planning!!! This doctor assured me that he will explain my son’s condition to the resident Pediatrician available in Emergency and leave only after my son was in safe hands! He did what he said. My Master arranged for such a noble doctor, too! And the building guard was too trying to tell me to be patient and not panic. But despite all this I was inconsolable as my son was still unconscious. My emotions had taken the front seat and even when I was unable to ‘feel’ the Divine presence that minute, It was still playing its part. As the resident doctor took charge, things started getting under control. My son regained consciousness, though he wasn’t stable yet. However, by now I had realized that my dear Master is keeping His word and always will. With this thought, all my fear vanished. I felt miserable for my little child going through so much of pain due to the Glucose drip, and blood tests, but deep down my heart I had faith that Mohanji is right there with me and looking after every small detail. I was no longer afraid and was firm that Mohanji is taking care of everything. Later in the night my husband too arrived. The next two days were difficult as my son’s fever fluctuated between very high and high but I was much calmer and knew that he would be fine. Sunday afternoon my son got discharged with his fever under control. Thank you Dear Divine Father for your love, care, and protection. Words are not enough to express gratitude …. On Thursday evening barely a day into HIS SFO trip, Mohanji expressed a desire to see whales. I was talking to him making recommendations to go to the Aquarium in Monterey. Monterey is a little town about two-hour-drive from SFO. He mentioned he would like to see them in their natural surroundings and handed Naren and me a brochure asking us to plan a whale watching cruise in Monterey. My mind was doing its dance, I told HIM that the cruise may be just a farce and we may spend about 2-3 hours in the middle of the ocean without seeing anything and return back disappointed. Well little did I know what the MASTER had planned for all of us. HE was persistent. Naren, generously bought tickets for all of us …Initially Hardeep and her husband Mehnaz didn’t plan on joining but later confirmed that they would also come with us. We had planned to do the 1:00 pm cruise on Sunday afternoon. However when we called to book our tickets, Mohanji mentioned that we should do the morning cruise. How could Naren not comply to the Master’s will? It was a two-hour-drive to Monterey and our cruise was at 9:30 am. We started at about 6:15 am giving us more than enough time to get to Monterey. It was a beautiful Sunday morning. I had barely got enough sleep the previous night but was yet energetic and ready to get up and go through the day. Wonder where all the energy came from . My mind however kept questioning – “WHAT IF there are no whales to watch ? “ . I just wanted Mohanji and Naren’s family to enjoy their SFO trip. Well we reached Monterey at about 8:30 am, had enough time to stop for breakfast and then all of us proceeded towards our cruise. On the cruise, we were enjoying the ride, I loved the deep blue colors of the ocean and the colorful jelly fish in the water not knowing what to expect. I saw a beautiful vision of Shirdi Baba in the clouds. I couldn’t believe what was happening. “Baba was right there with us”. The wind was blowing and the weather was rough. The ocean was roaring. Our cruise was riding on the strong under currents however strangely everything seemed under control despite the bad weather. I knew deep within that Mohanji and Baba were protecting us . Our cruise kept heading deeper into the sea where there was more likelihood to see the whales. We were all waiting anxiously. The first whale showed up and we barely got a glimpse of it. It was there just for a few seconds. For the next few minutes our cruise was just proceeding forward and there was no sign of any more whales. I kept asking myself – Is that all ? When Mohanji is with us, life is full of beautiful surprises. It’s about how receptive we are and how much we are willing to surrender. Suddenly few minutes later another whale showed up close and then the next one and the next one. I was standing next to Mohanji watching the beauty of creation but my mind was not done with it. It wanted more and so I repeatedly kept saying out loud “ Come again”. At one point in time, it was as if Mohanji was using me to give commands to the whales. I clearly remember saying out loud “ show me the complete dive” Up until now we were struggling to see the entire whale in and out of the water. Right at that instant there was a whale that did do the dive. And then I said “Once More” and the same whale did the dive again. I was not yet satisfied and said “Once more again” and there was yet another somersault. I knew then Mohanji was giving the commands through me. Well my story does not end here. The whales tirelessly entertained and pleasantly surprised us by somersaulting, showing their tail and doing their dives but they did their grand finale in the most beautiful way. Just as our cruise was about to head back to shore and we thought that we were done, one of the whales flapped its fin three times in and out of the water as if to say “bye”. We were all spell-bound. This was nothing short of a miracle. You don’t need a common language to communicate with another soul. You just have to watch and listen . Day 3 – trip to San Francisco around the city. Saturday morning, we had a great start to the day. It seems like my prayers of many life times were answered. 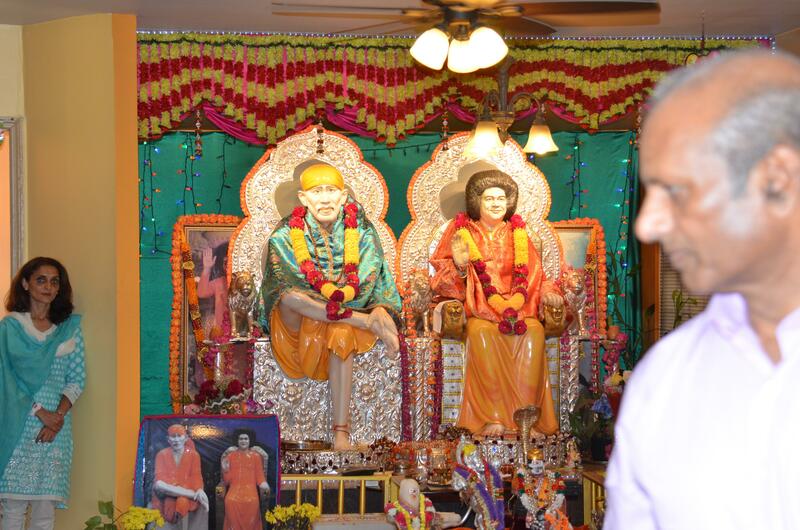 I had a beautiful experience of visiting the Shirdi Sai Temple in Milpitas with Mohanji . What a better way to visit Baba. Right after the temple we decided to do a day trip in SFO city. SFO has a great public transport system and even after living there for such a long time, I never really used it. I live 40 miles away from the city but always prefer to drive. However this time as per Mohanji’s wish we decided to explore San Francisco city as tourists. We took the BART (train) into SFO city. Having a car , I never cared to use the public transport much. However Mohanji’s desire to see SFO how a tourist would see, allowed me to have a different experience of SFO city. We reached SFO city around 3:30 pm on Sat afternoon. We bought ourselves tickets for Big Bus tours that takes you around the city to the popular spots but also gives you the flexibility to hop off and hop on at every favorite destination you like . We started off with the beautiful Union square, which is one of the main shopping districts of SFO, then we covered the clock tower, market street and fisherman’s wharf. I had a beautiful experience just being guided for a change. I like being in control and prefer driving and showing people around SFO city . However the Big Bus trip was all about just letting go and enjoying the ride. It seemed like I was the tourist and Mohanji knew SFO very well. On our way back from SF, we took the bart back towards Fremont Bart Station where my car was parked earlier that day. I got into the car and was backing out with my attention in a conversation that Mohanji was having. As I started to back up in the parking lot getting ready to leave I saw that I suddenly went and bumped another car parked diagonally across from me. While backing up I had not noticed the other car at all. Unfortunately the other car was not just stationary and had a driver who was about to back up, too. I knew I was at fault and was worried that the driver may be upset. To my surprise when I stepped out of my car to see the damage done, there was not a single scratch there. It’s like my car had lovingly kissed the other car …. The other driver seemed to be well and nothing happened to his car, either, except a very fine scratch. We didn’t need to exchange any insurance information. How did it happen that my car touched another car and there was not a single scratch . This was one of other Mohanji’s leela. A couple of weeks after Mohanji left I had planned a trip on the labour day weekend with some friends to wine country – Paso Robles. On the way back to San Francisco, I was sitting on the back seat of the car staring out of the window. As much as I had a good weekend with great company and a fun time with my friends, I hated the fact that because of peer pressure I had drank some wine. I don’t usually drink . I was sitting there thinking to myself , will Mohanji forgive and will Mohanji stay with me ? I was randomly looking out the window when suddenly I saw Mohanji’s face appear in the clouds…I kept rubbing my eyes thinking that I was imagining things. Mind is like that  …it constantly doubts even after so many experiences. It cannot easily accept the GRACE but the image in the clouds stayed longer than a mere imagination. I just had to share this experience for I am sure many of us time and again doubt the GRACE in our lives. Several summers have come and gone but I can honestly say that this summer has, by far, been the best summer of our lives. Did we get away from home? Yes. Were we at an amusement park? Yes. Did we take the cruise? Yes. We did it all but not exactly! It was an out- of- the- world experience. In order to give all the details, I have to go back a few years. My husband, Ganesh and I have been connected with Mohanji since 2010 but got the boon of being in His physical presence only in February of 2013. We had planned a trip to India and were blessed to be with Mohanji on his birthday in Shirdi. We also got to travel with him and set foot at the divine land of Datta Tapovan. 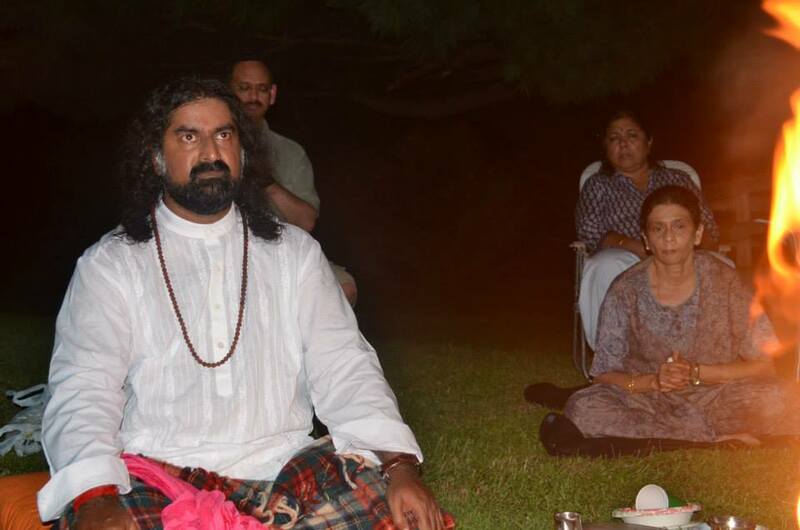 Though my connection with Mohanji has always been strong, this trip brought in a transformation deep within me. He embraced me into his consciousness, and I melted and molded into it. I understood the real meaning of complete surrender and faith which I carried with me and life seemed to be moving smoothly and beautifully. 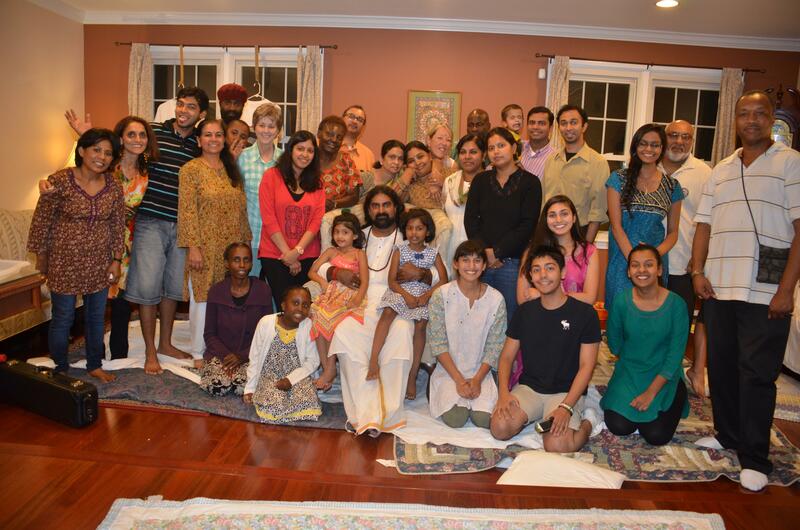 We wanted more people to experience what we had experienced in the company of Mohanji and wished He would visit the US. In June we got the news that Mohanji’s visa to the US had been approved. We were all extremely excited and started planning his trip. Finally, with a great deal of anticipation we went to receive the Master at the airport. It was an unexplainable blissful moment to see him arrive. The real story began then because the things that followed were pure divine. Mohanji exemplifies unconditional love and His being here made everyone experience it. We could see transformation happening right then and there. People who knew nothing about Mohanji just fell immensely in love with him and did not want to leave his side. People who were strangers to us until then came in and out of our house as if we were family and the best part was that I did not mind at all! Before we go any further I have to tell you all about a personal experience that I had with Mohanji. All of us have wishes and always want it to fulfill. I too had a wish. Just before Mohanji left India, the “Kailash with Mohanji” book was launched and I really wanted a copy of it. It came up several times in my mind to contact our dear friends, Shashank or Yamini to send me a copy through Mohanji but I was so preoccupied with planning the visit that I did not get a chance. As soon as Mohanji reached home and settled in, he opened his suitcase and said, “Lata, this is for you.” I turned around and looked at him handing the book to me. I was speechless. How could he have known! All I knew to do then was to prostrate in front of him and accept this priceless blessing. 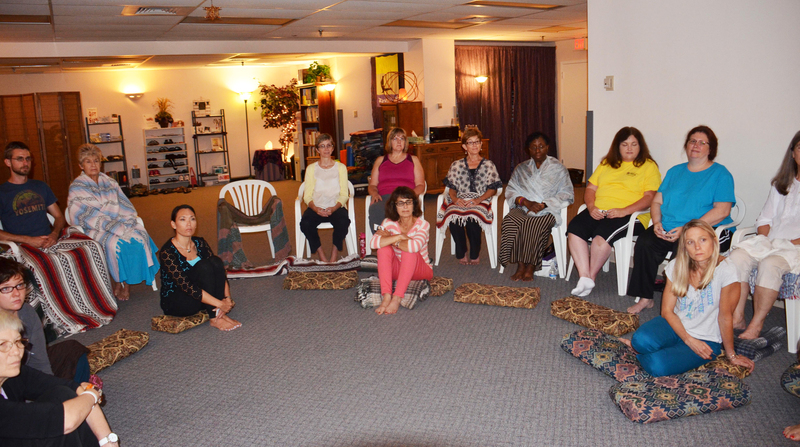 We had planned spiritual trips not only in Virginia but also in several other states. Another wish that I had was that Mohanji’s divine feet must step on the grounds of New York. Since New York is an important nerve center of America and the potpourri of several cultures, creed, religious beliefs and color, I thought it essential for Him to bless this land. We all know that New York has gone through a lot and the presence of the Master would only sanctify it. Our BTW (Bless the World) family member, Vinod and I, had discussed about the New York trip several times but our work schedules and lack of support group there made it seem like something impossible. 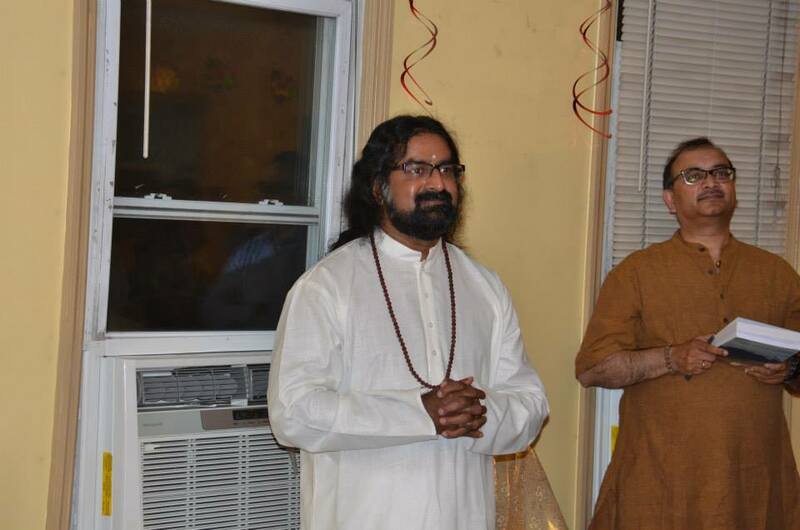 In spite of all our apprehensions, faith in Master prevailed and Vinod was able to put an excellent program in place not only in New York but also in New Jersey. Not only that, he was also able to organize an interview in iTV which was spontaneous and brilliant. Everything was falling in place and miracle after miracle kept happening right in front of our eyes. 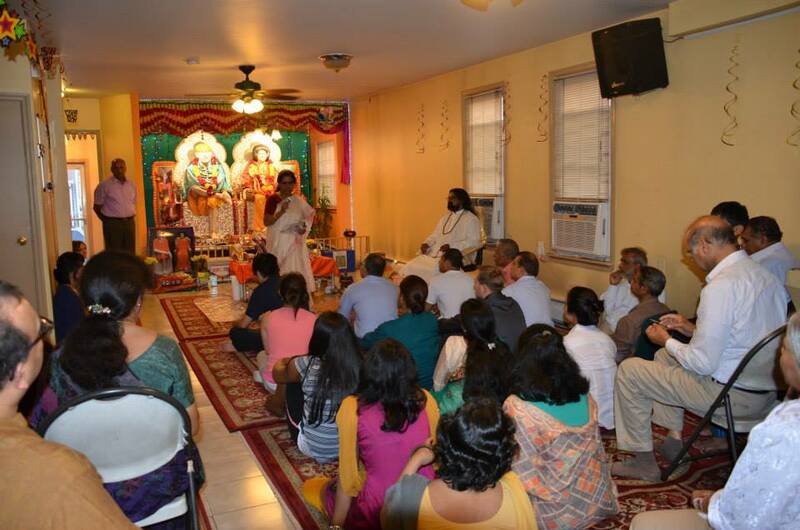 After the public event in Virginia of Aug 4th, Ganesh and I had planned to drive Mohanji to New Jersey, early morning, on Aug 5th and had also arranged for a program on the evening of 5th at the Sai temple there. We had even booked accommodation in NYC. All these arrangements were done more than a month ago. A sudden important meeting at work came up and I was in a situation where my leave was cancelled. Meanwhile, Ganesh has applied for his citizenship and got a letter stating that his interview was going to be on the afternoon of Aug 5th. I already knew that Vinod was having a tough time at his work too. We were in a bad predicament and did not know what to do. As always the Master knows it all but still plays his games. I just surrendered to him and prayed for a miracle to happen. Lo and behold I get a call from Vinod. He said, “ Lata I wanted some one -on -one time with Mohanji so was wondering if I could drive him to NJ. I will pick him up in the morning.” Even though I wanted to tell him that he said he would not be able to take anytime off 10 days ago, all I could say was “Thank you”. Remember I had mentioned about Ganesh’s interview with USIS? Here is the rest of that story. He went for his citizenship interview at 2:45 pm, thinking he was a little early for the 3:00 pm interview but he was in for a shock when he got there. His interview was, apparently, at 1:00 pm and not 3:00. Ganesh, who is always good about things like this had misread the letter. Now he was 2 hours late and was told that the office was closed. He had to re-apply for the interview and it might take weeks. He was really mad at himself. How could he have missed it! After a few minutes he composed himself and with utmost sincerity did what he could do. He pulled out Mohanji’s eye card and connected with the Master. He then walked up to the receptionist’s desk and requested to meet with the interviewer. In about 10 mins an officer walked up to Ganesh and invited him to the office. He completed the citizenship interview. 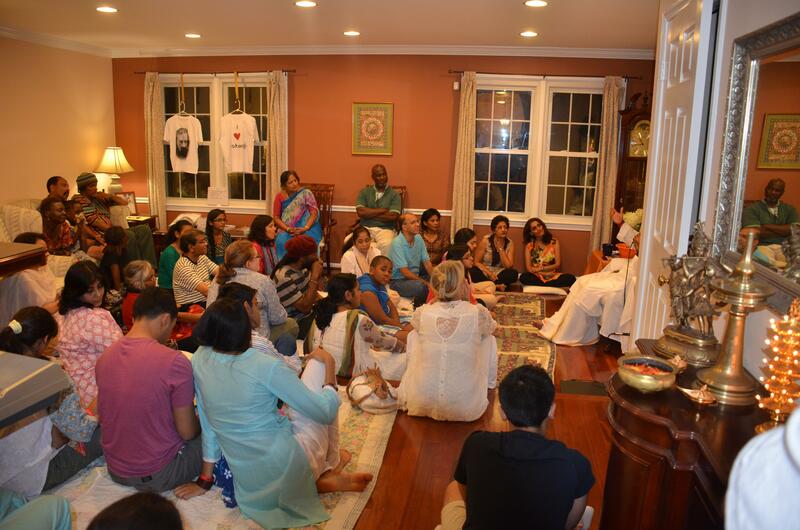 The key point was that it was after-hours and this incident cannot be anything else but the grace of the Master. 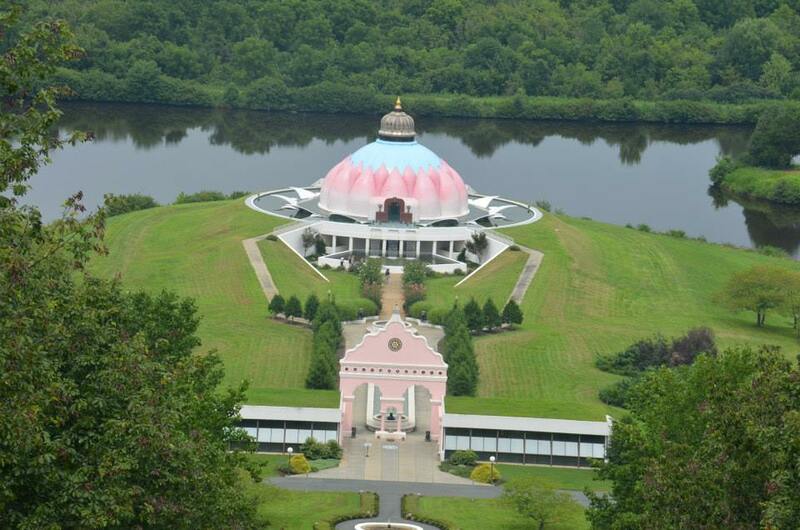 The Om Sai temple in Flushing, NY, is absolutely breathtaking. It is unique because the temple hosts a life size idol of both Shirdi Sai Baba and Satya Sai Baba. 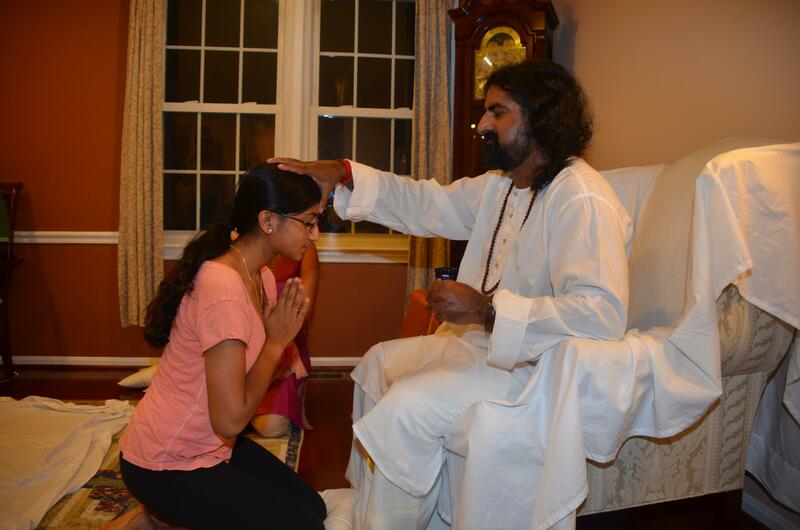 Dr. Rao takes utmost care and very loving worships here. 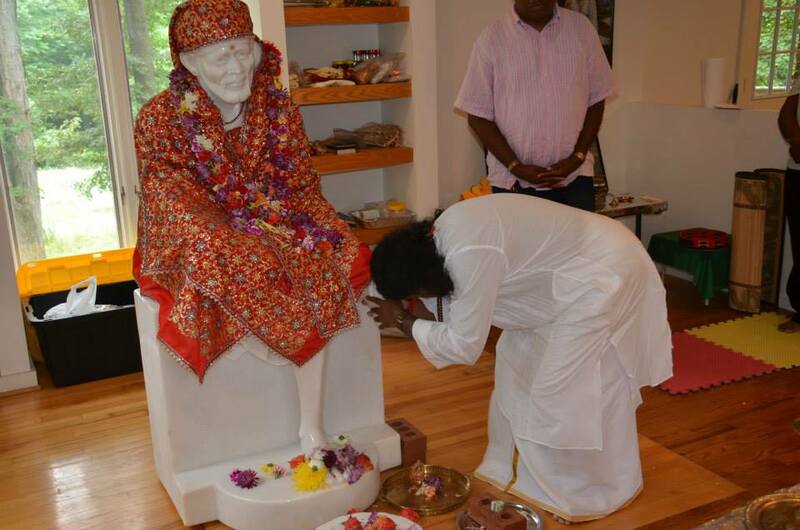 It is believed that Satya Sai Baba resides here. Mohanji paid his respects to Baba and offered both his books, Power of Purity and Kailash with Mohanji and the CDs at the feet of Baba and gifted the same to the temple. We had two amazing events here. We had a Satsang on the first day and the Power of Purity meditation the next day followed by Shakthipat given by Mohanji to the devotees. 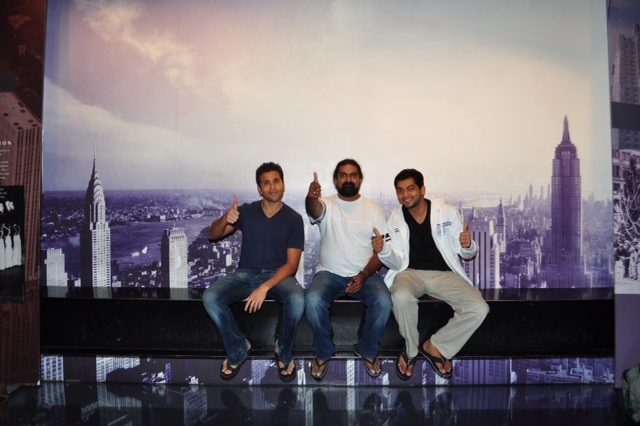 In spite of having a hectic schedule we were able whisk Mohanji for some sight-seeing. He became one with the kids there. He enjoyed his ride in the open bus, graced the total emptiness of Ground Zero as well as the historic grounds of Ms. Liberty and even got a caricature done. He posed innocently for pictures and thus celebrated New York. Hanumanji, also known as the monkey face God, has appeared to grace Mohanji and his devotees several times and you can read those experiences in the book “Kailash” or the blog (-https://mohanjichronicles.wordpress.com/2011/02/13/lord-hanuman-%E2%80%93-). 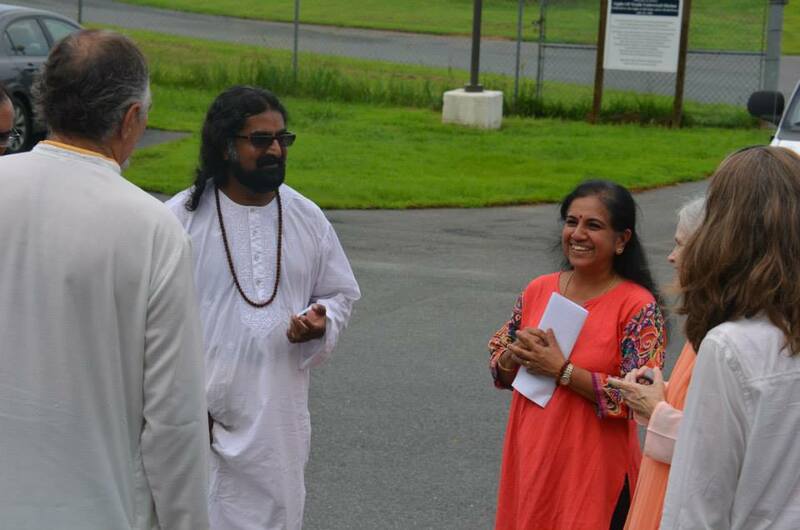 So it was absolutely essential, we thought, for Mohanji to visit the new upcoming Sri Hanuman temple of North America. 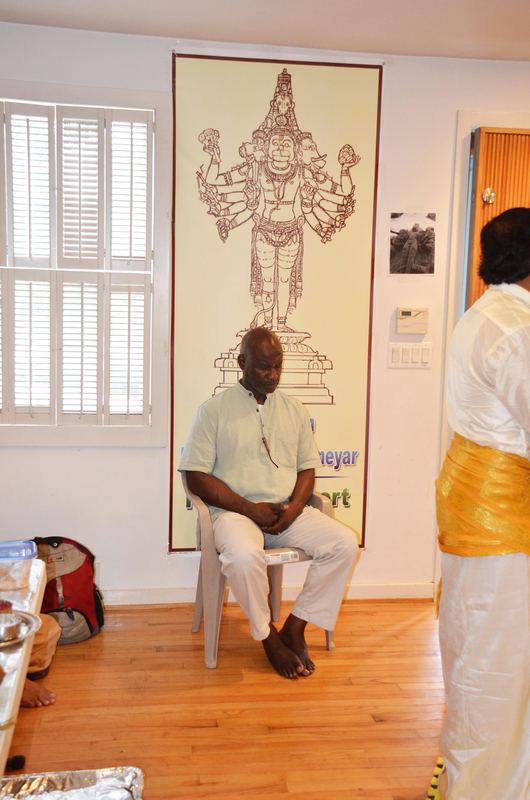 Ramu Arumugam and Satish Sreedharan, trustees of the temple, were more than happy to welcome Mohanji. They received Him with a lovely silk shawl and two other devotees, Badra and Padma, offered pada namaskar (prostrating and touching His feet) and chanted the Dattatreya mantras (Sanskrit verses). 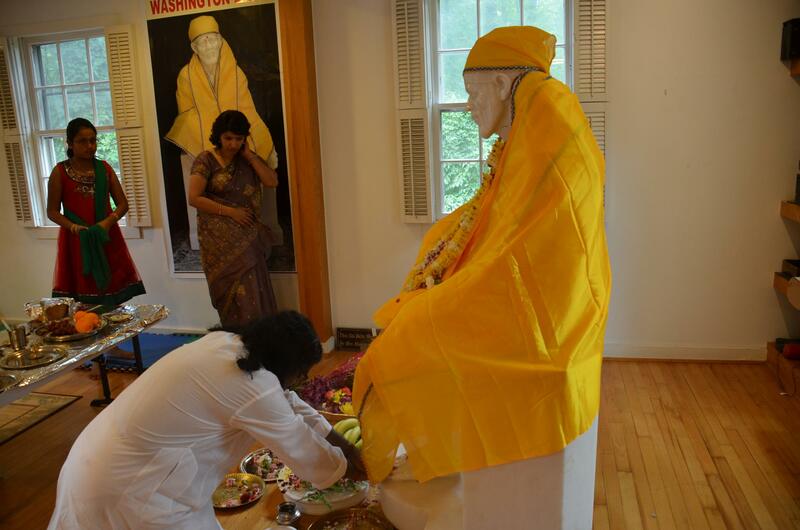 A beautiful silk shawl was handed to Mohanji, which, with great devotion, he draped around the statue of Shirdi Baba. 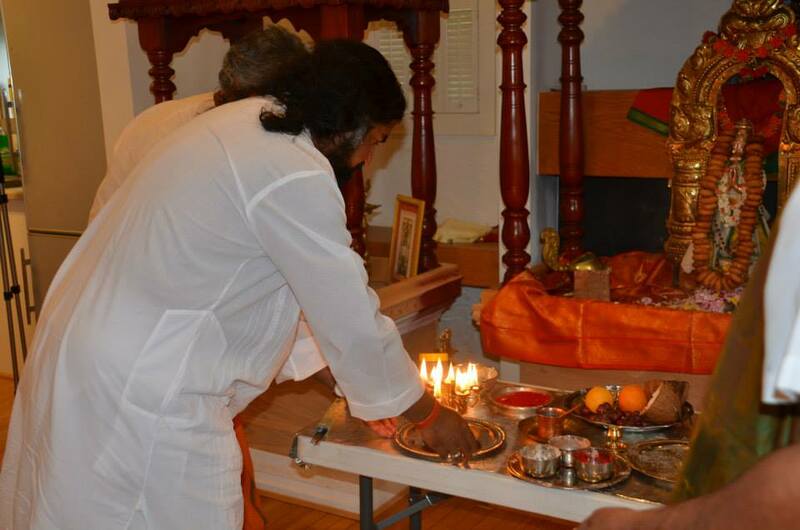 Mohanji, with total devotion, conducted arti. He then led the Vishnu Sahasranamam (one thousand names of Lord Vishnu) and Hanuman Chalisa (forty verses in praise of Hanuman). The entire temple was filled with such aura that I almost expected Hanumanji to appear in form and he did appear except in different form. A gentleman clad in black (generally worn by people taking a vow of temporary sainthood when they go to visit Lord Ayyappa of Sabari hills) walked into the temple suddenly. 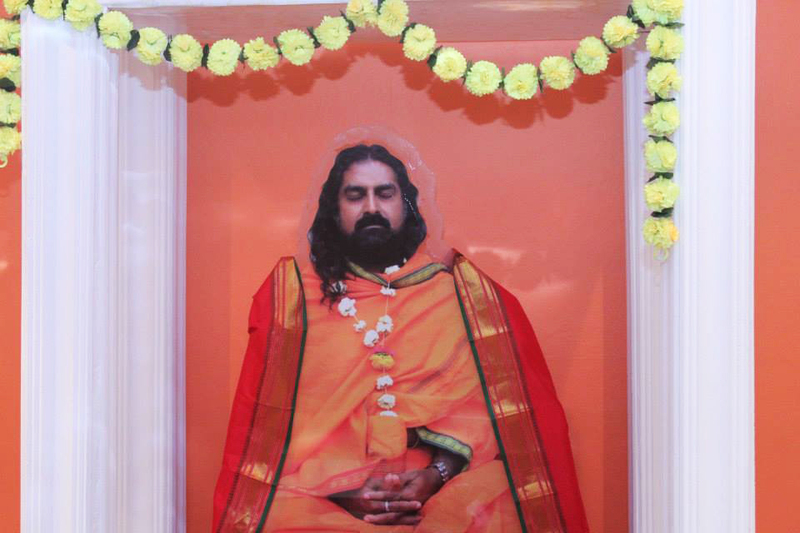 He looked at Mohanji, who was in deep meditation, with love and recognition and then just left. While he was there his focus was only on Mohanji. He stood there momentarily and then left. I was mesmerized by this incident that I did not even think of clicking his picture. Was he the Hanuman in human form? Who knows but who dares to say he wasn’t? Afterwards Mohanji blessed the devotees by transferring divine energy into them (Shakthipat) using Viboothi (the divine ash). 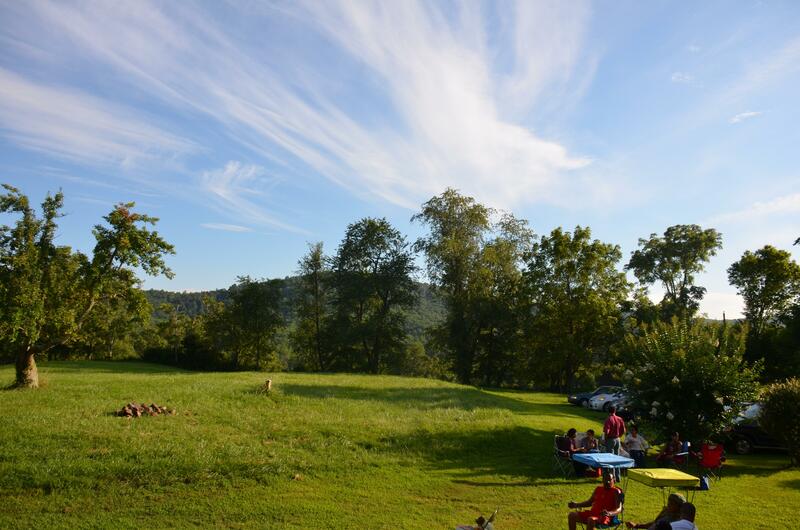 The Plains in VA is a beautiful town and home to the Green Meadow. 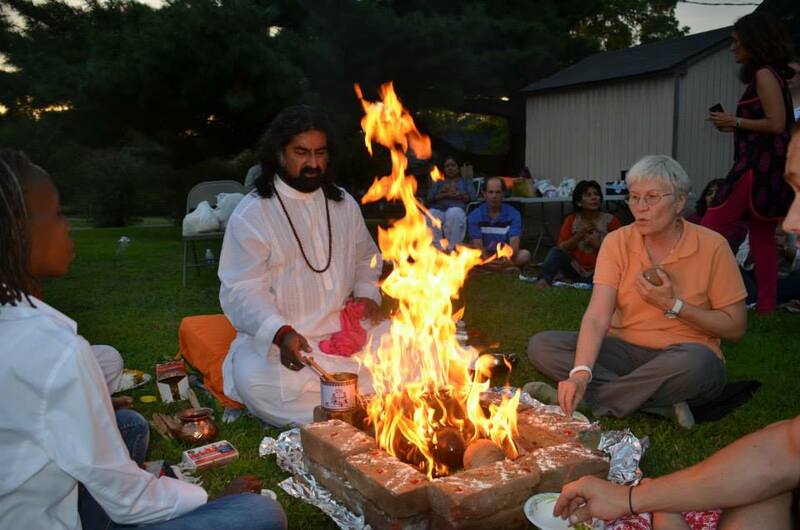 One of Mohanji’s ardent devotee, Annette, had requested Him to conduct a homa – fire ceremony (usually done to remove negativity) in her yard. As the homa date was getting closer, we discovered that the weather reports were not favorable to have an outdoor event. In order to get a tent and make indoor arrangements we needed to follow a lot of rules and regulations. We did not have enough time for any of that and we did not have a plan B. Of course, as expected, we started getting anxious phone calls because people were going to be driving from far to be a part of this. We were panicking but the Master was, as always, quiet and composed. Another person who was not agitated was Annette. Her tremendous faith in her Master kept her calm. She decided to go on with it, come what may. 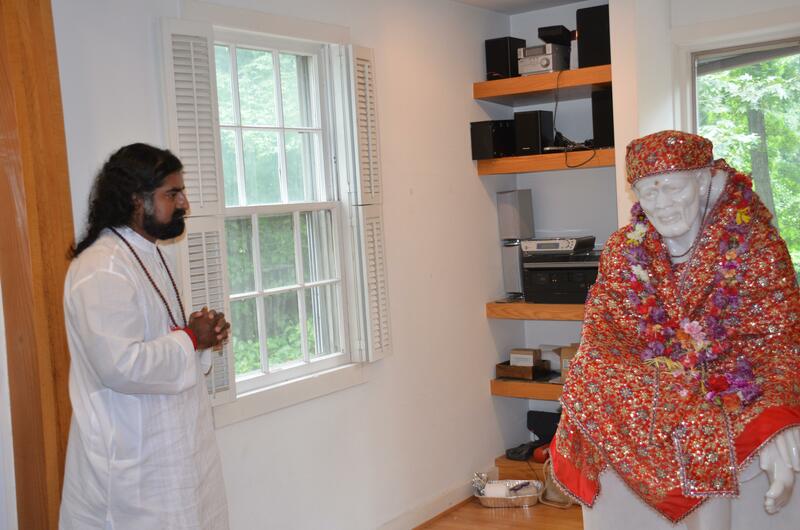 She told another devotee, Viji, that she had total faith in her Master and he will take care of the weather. The Master did take care of the weather as we had a beautiful and welcoming sky over our head and there were thunderstorms in the nearby areas. 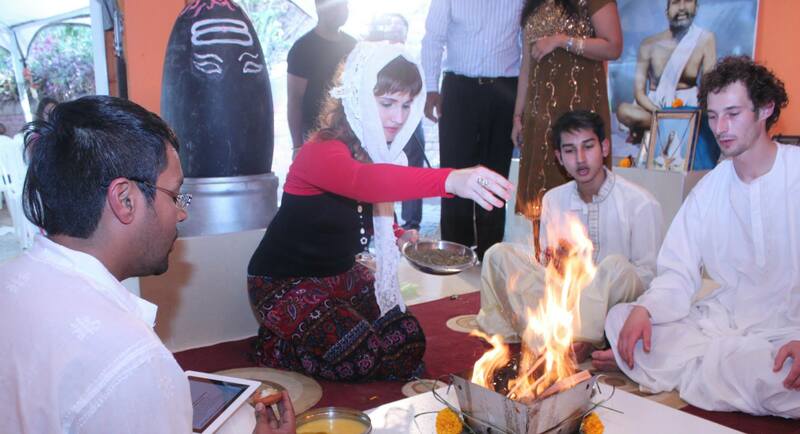 Annette’s unconditional love and trust in him paid off and the homa began and the deities arrived and graced the occasion and blessed the participants. 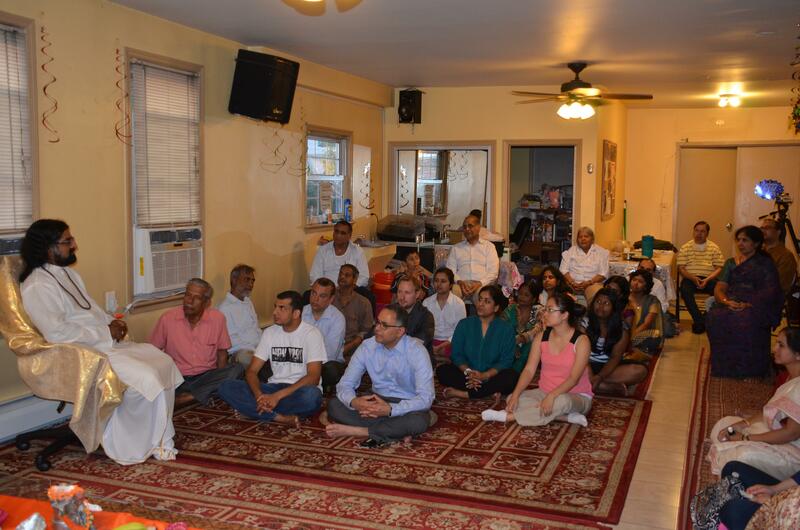 Several devotees from several cities joined this unique homa conducted by Mohanji to ward off negativities and past karma. 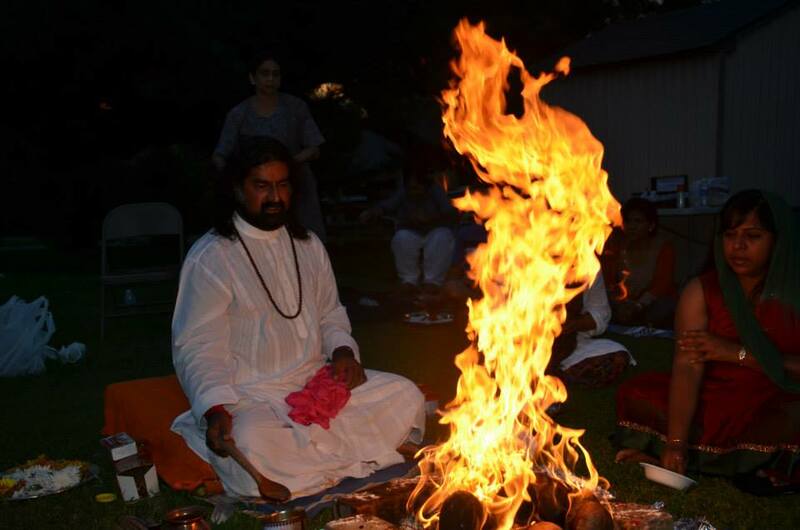 Mohanji explained a technique and asked everyone to surrender their negativities and acquired patterns from the past, amidst the homa. As the stars filled the clear blue skies, the fire rose to the sky as though it was inviting the deities and angels from the heaven to come down and bless us all. The entire atmosphere was charged with supreme energy and we were sinking deep into it. Even though the heat became unbearable for us and we started to move backwards, Mohanji sat right next to it throughout. 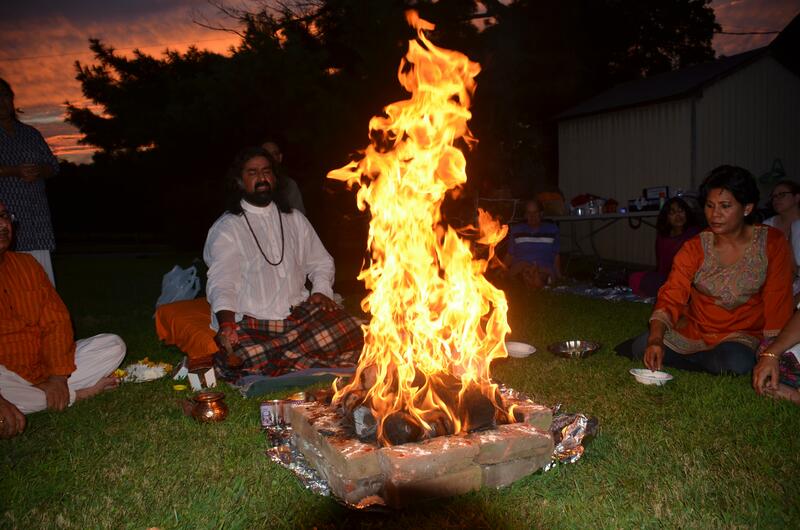 As the sun was setting on August 10, 2013, The Plains in Virginia was totally transformed with the arrival of several deities during the Homa performed by Mohanji. 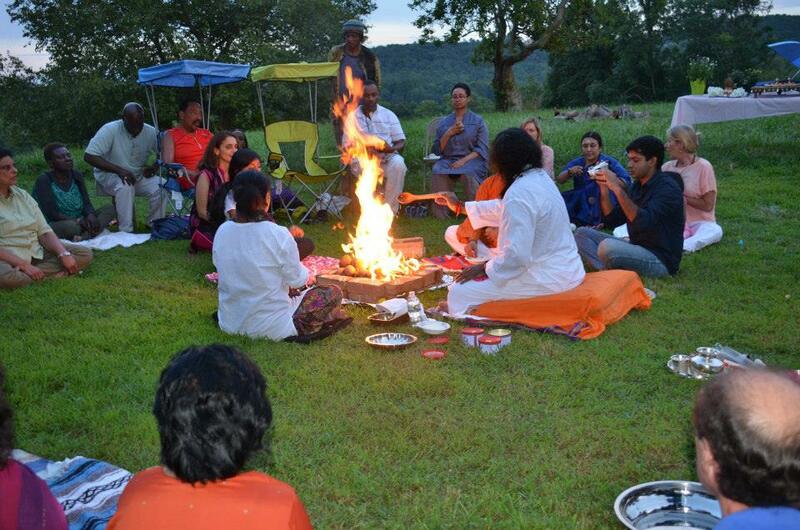 Several devotees joined this unique Homa conducted to burn negativities and past karma. 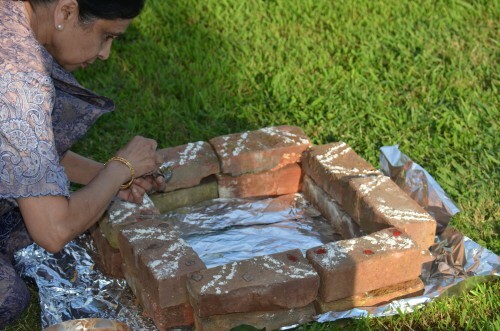 Mohanji explained a technique and asked everyone to surrender their negativity and acquired patterns from the past to be offered in the havan, while the invocation Mantra were being chanted. 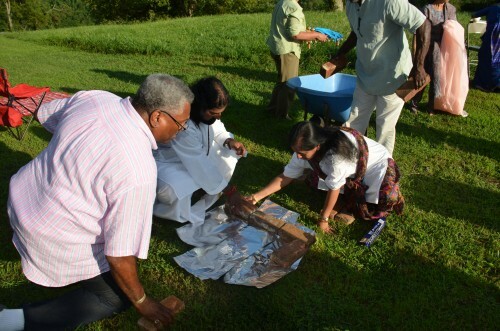 People experienced some miraculous moments during this process. There were tears of gratitude and complete peace inside and divinity outside. 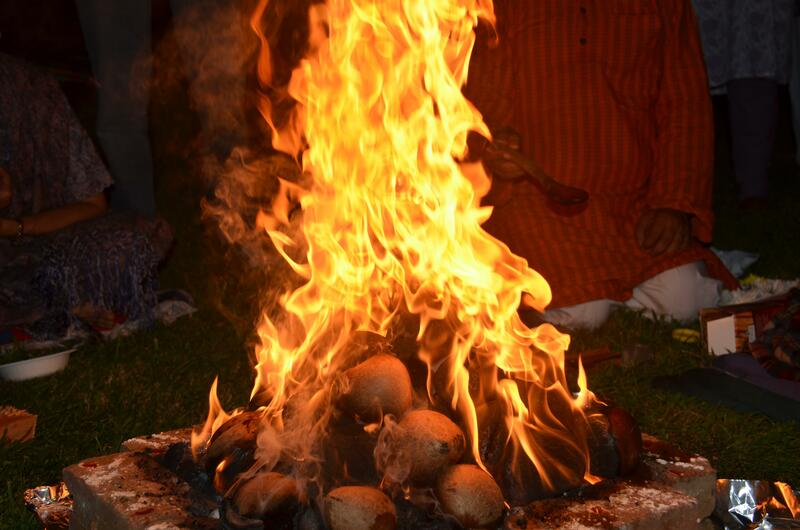 People had seen their favorite deities in the fire and some saw Mohanji Himself. There were tears of gratitude and complete peace inside and divinity outside. 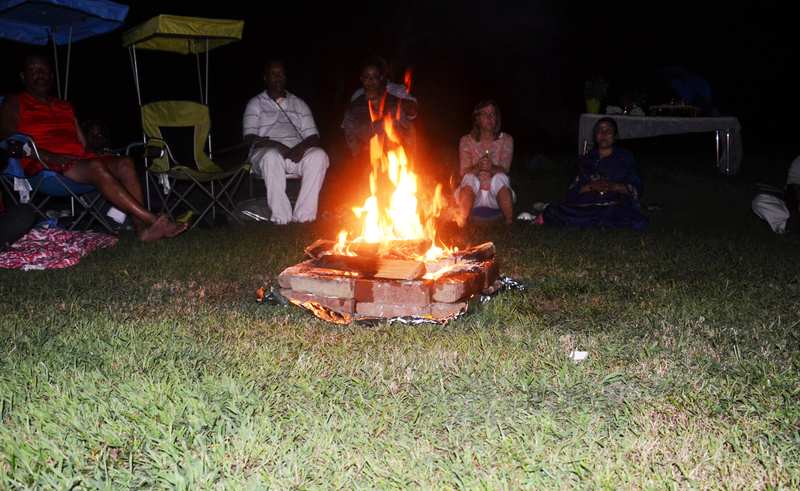 Almost 50 devotees participated in the fire ritual and sought blessings and this included a dog who was very quiet, in a meditative mood throughout the event and walked away silently and in total peace. Along with 50 odd people who were blessed to be a part of this, there was also a dog that sat through the entire ritual in deep meditation and walked away very quietly and peacefully. The Homa ended at about 10 pm and the star studded sky looked extremely beautiful. Even the thunderstorm had bowed to divinity and given way, just like the oceans did for Lord Krishna when Vasudeva was taking the divine baby away from Kamsa (Hindu mythological story of Lord Krishna). 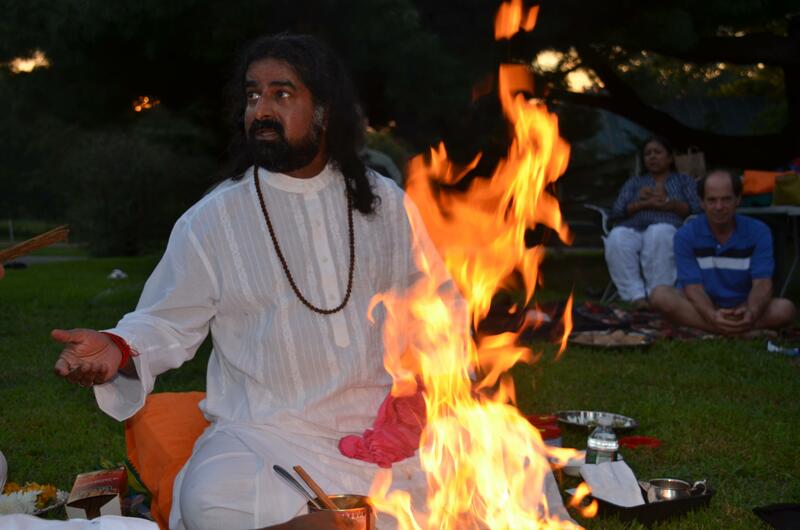 The sublimity of the Homa continued for several days when Annette watched birds and animals unknown to her came for a visit. 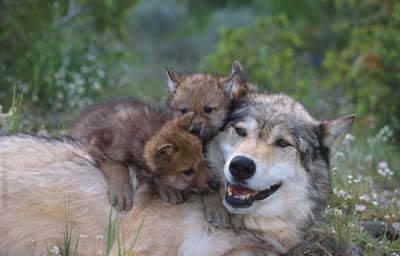 Even a momma wolf and her little ones came to seek blessings of the Supreme Power. A true devotee and a pure soul, Ralph Davis was really excited when he knew of Mohanji’s arrival and he wanted to do something special. He had arranged for a Power of Purity Meditation at the Yoga and Healing center at Fredricksburg but the Lord had other plans for him. Suddenly, a few days before the event, Ralph’s soul left his body to become one with the ultimate consciousness. While we were all a little perturbed and not sure about what to do, Mohanji stood his grounds and decided that we will go ahead as planned. So we drove for over an hour, in heavy traffic, to meet Ralph’s partner Michelle and her friends. 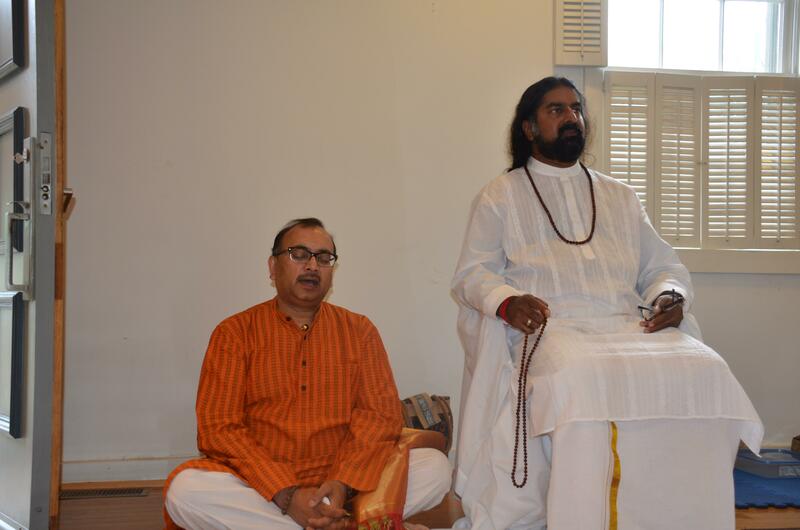 The Power of Purity meditation was extremely powerful and the Q&A session that followed was mind blowing. Everybody wanted Mohanji to stay and not leave. 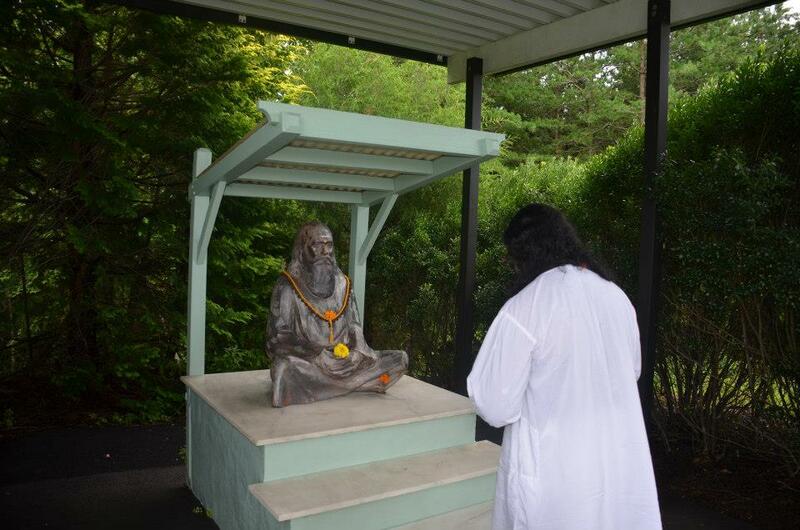 I had heard so much about the sublimity and beauty of the Yogaville Ashram that I was keen on taking Mohanji there. I had contacted the Ashramites, Sharadananda Swami and Dayananda Swami, who, after reading about Mohanji, were delighted to welcome him to the Ashram lands. 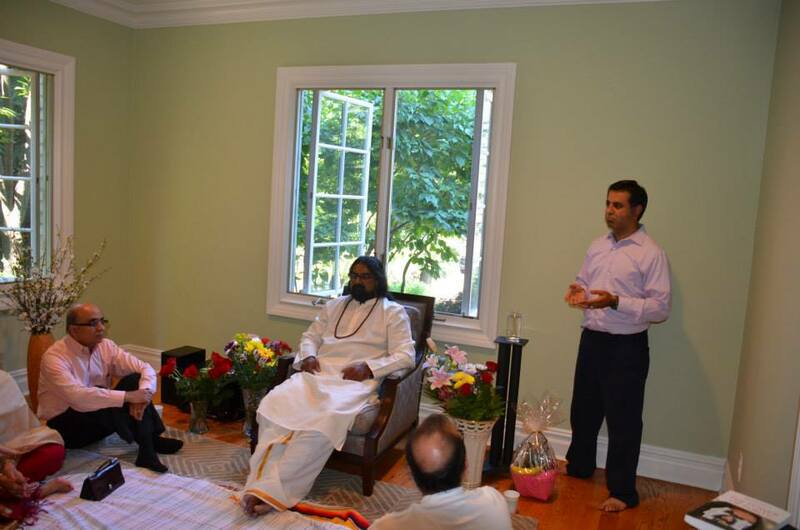 They invited him to join them for lunch and requested that he conduct a Satsang and Q&A session. 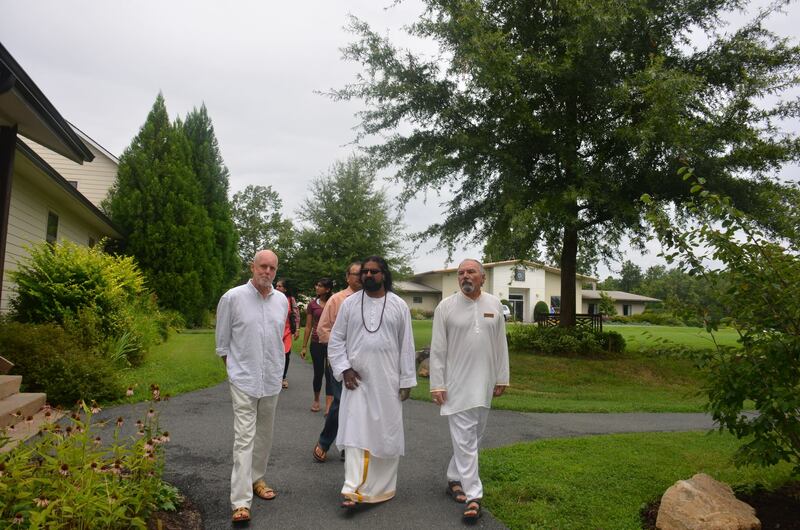 On a beautiful Sunday morning, our beloved friend Balakumar and his daughter Meghna, along with our family, drove along the beautiful Virginia country side with Mohanji to the lush 800 acre Yogaville Ashram. 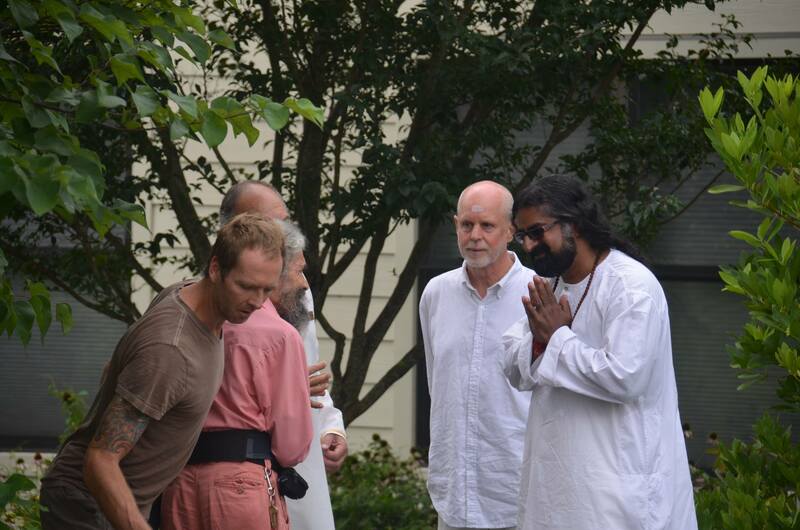 Yogaville is more than an ashram, Yoga Teacher training facility or a Yoga retreat. 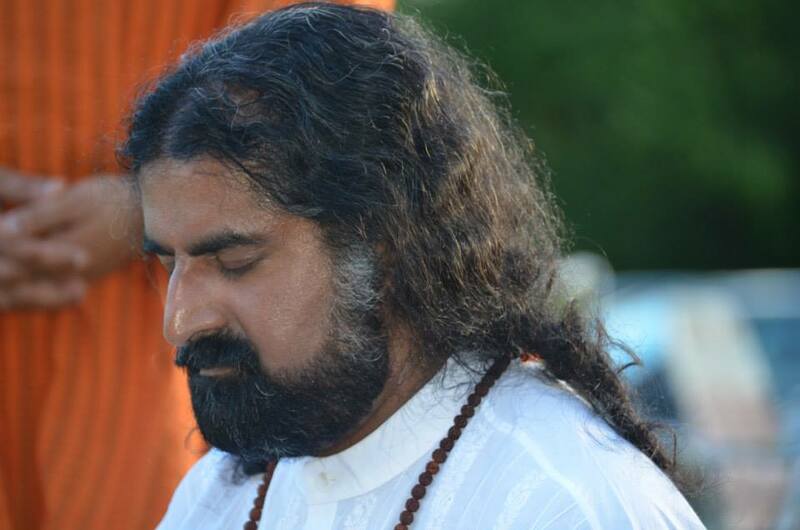 It is a vibrant spiritual community built on the precepts of Integral Yoga as taught by Sri Swami Sachidananda (Sri Gurudev); blending the power of the various branches of yoga into once complete practice. 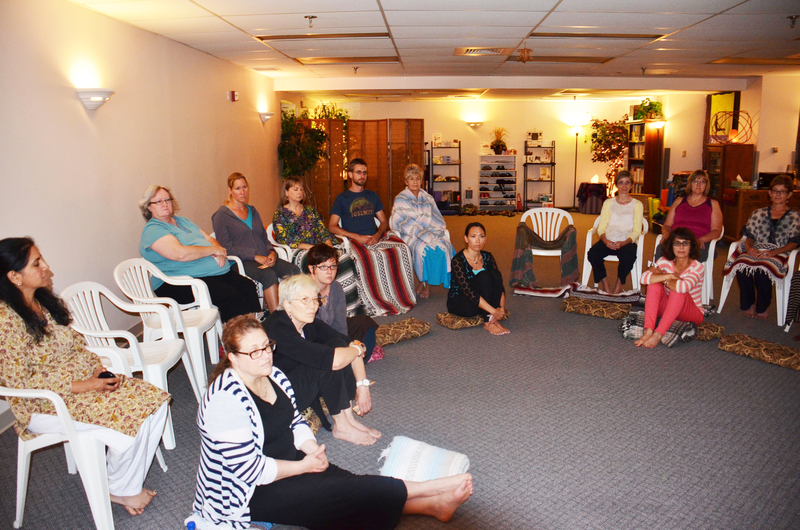 Integral yoga’s holistic and gentle approach brings benefits to many aspects of one’s life. 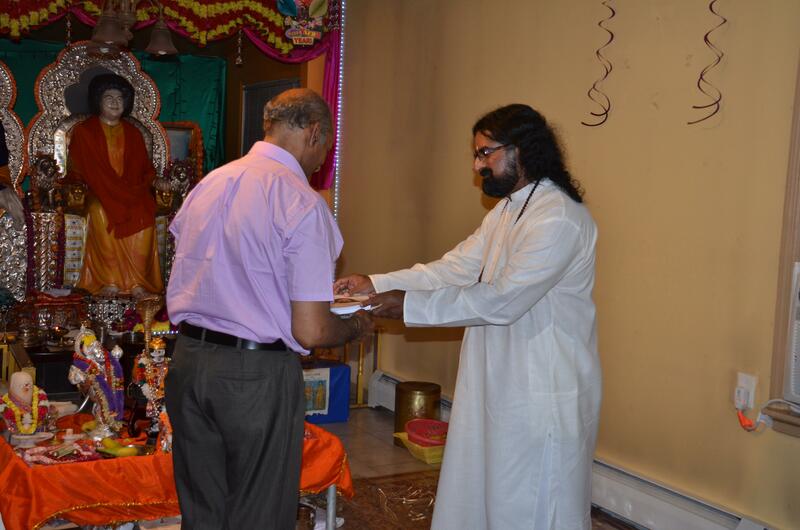 Mohanji was honored and warmly welcomed by Reverend Bhagvan Metro, Brother Ganesh and other ashramites. He was, very lovingly, served a delicious Satvik (vegetarian) lunch at the Sivananda Hall followed by a 90 minute tour of the entire ashram that included sacred sites such as Chidambaram (another name for Lord Shiva), Shri Gurudev’s Mahasamadhi, the Dancing Nataraja Shrine and last but not the least, the amazing LOTUS inter faith shrine. It is the first shrine ever built to house altars for every major faith and also faiths less known and those that are not known yet. 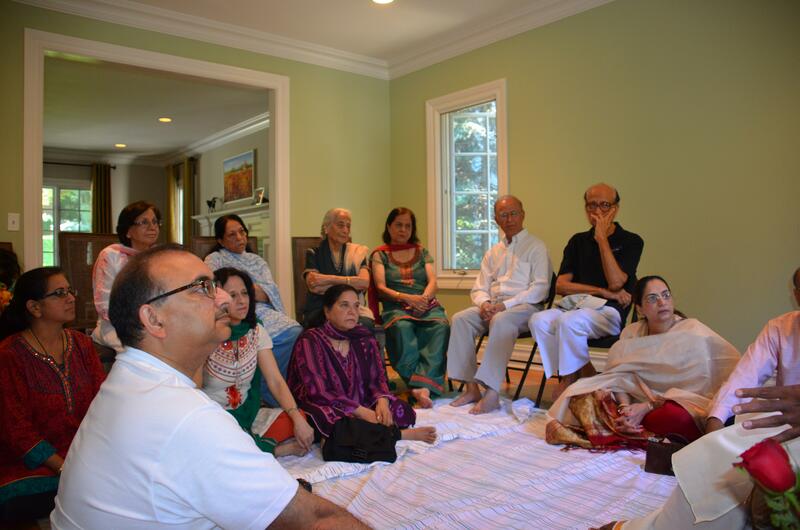 Later in the afternoon, Mohanji spoke to the ashramites and visitors about Hinduism and Guru Tatwa (Being a Guru). He, very eloquently and beautifully conveyed the essence of Hinduism, shared his innumerable experiences and answered everyone’s questions relentlessly. The leadership of the Ashram and the participants thanked Mohanji profusely for having taken the time to visit them and shower them with such Wisdom. They requested Mohanji to spend a night with them at the Ashram but due to time constrains we were unable to accommodate but left with a promise to come back next year. 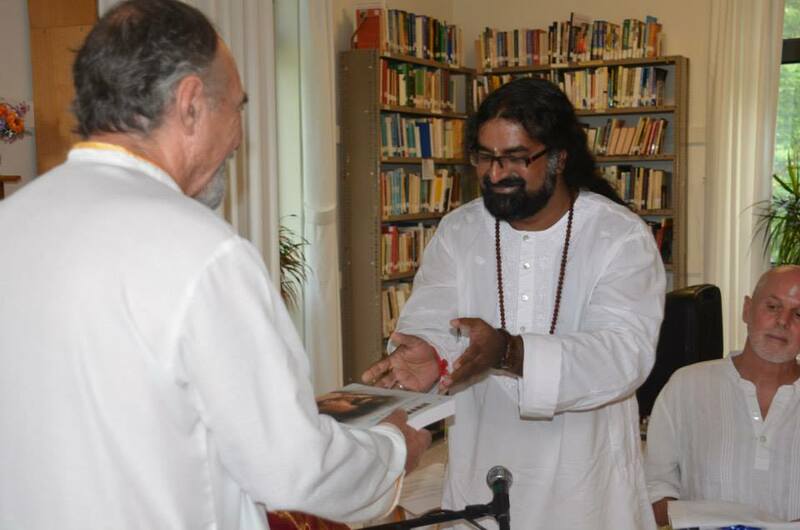 Mohanji donated the books “Power of Purity” and “Kailash with Mohanji” to the Ashram library. Here are the pictures that tell you the story! Before we knew, the beautiful summer with all our roller-coaster rides and trips and cruise had come to an end. With whatever limited time Mohanji had, he managed to have a one on one meeting with whoever wanted to, including my 9 year old nephew. Well, right from the time we told Sid about Mohanji’s arrival he had been insisting on wanting to meet him but they live in Cincinnati and were not able to visit VA. On our way back from Yogaville, Sid happened to call Ganesh through facetime and asked to talk to Mohanji. Mohanji immediately took the phone from Ganesh and spoke to the little 9 year old boy. Sid was just ecstatic. He chatted with Mohanji happily and called Him “cool”. Mohanji’s presence created an aura of divinity and purity felt by hundreds of people ranging from 9 year-old Sid to an 80 year-old Shantha mami. The power of unconditional love that is MOHANJI. I asked for a copy of the Kailash book and Mahadev came down from Kailash, gave the book and stayed with us for a few days…. My heart is filled and so are my eyes, as I say, lots and lots of love and gratitude to you, Mohanji. Thank you very much!